Additional Info: The herb is indigenous to India. 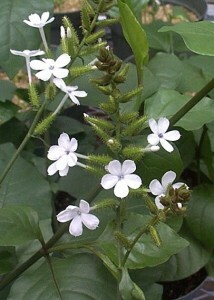 It can also be found wild or cultivated in Ceylon, Southern India, North and East India. Plumbago zeylanica is a cultivated derivate which allegedly originates from Plumbago rosea. Active Components: The root is rich in acrid crystalline component Plumbagin. This constituent can be found in all white leadwort variations in a concentration up to 1 percent. Elements Applied: Seeds, root bark and root are commonly applied in herbal medicine. Used For: The root is specifically applied to increase digestive activity and boost appetite. Plumbagin is potent of triggering the central nervous system, when taken in normal quantities, however, in large quantities it can lead to paralysis and even lethal outcome. The herb can also mildly reduce blood pressure. Plumbagin acts as an irritant and is characterized by antiseptic capacity. Taken in small quantities it also produces a diaphoretic effect, but large quantities can lead to lung failure and fatality. Scientists state that this effect comes as a result of its direct action on the muscle tissue. The root is characterized by strong narcotic effect. It may lead to miscarriage. The herb leads to fetus rejection, alive or dead. Herb’s root is additionally employed for spleen enlargement. In Ayurvedic medicine the herb is a popular remedy for fever-associated conditions. Root made into paste is spread over abscesses externally to help open them. Paste aided by salty water, vinegar, or milk is used topically for leprosy in various skin conditions, hard-healing sores, scabies, and so on. In Ayurvedic medicine the herb is also used for skin conditions, diarrhea, anasacra, hemorrhoids, and dyspepsia. To prevent symptom reappearance the root bark tincture is applied. Preparation and Intake: The herb is used in form of tincture, pills, powder, and paste. Safety: Warning! White Leadwort should be avoided during pregnancy, or used in small quantities, as it may lead to miscarriage. If used in abnormally high quantities, the plant may lead to paralysis and lethal outcome. It can also lead to lung failure. The herb is known to produce a strong poisoning effect if used improperly. The plant is dangerous, and should be used only under strong medical control.